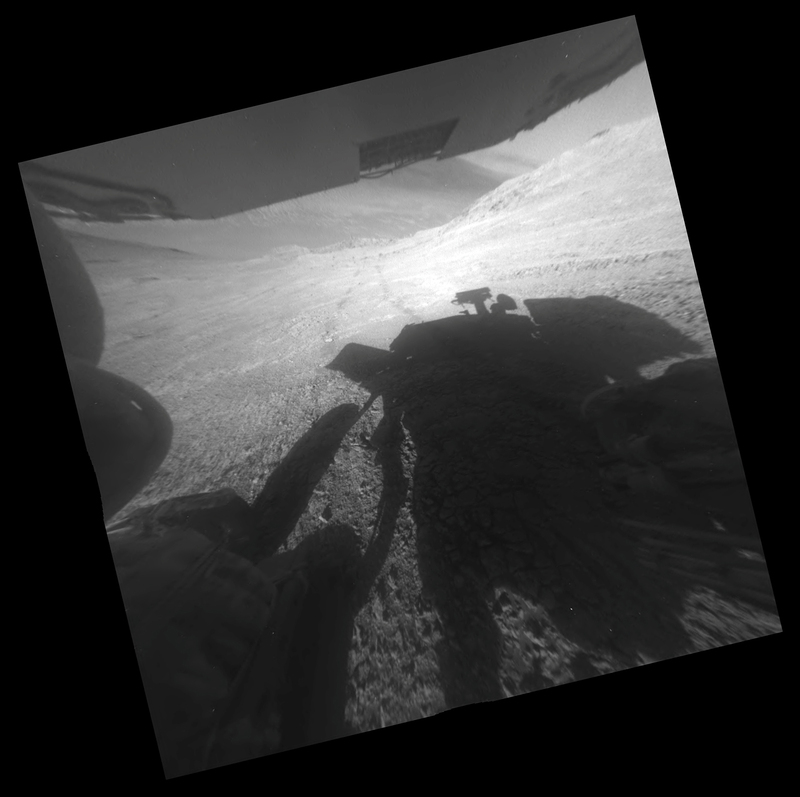 Almost, but not quite… the Opportunity rover is now driving to another area on the hillside where it is currently located, after attempting to reach a difficult rock target. The rover wasn’t quite able to get close enough to the target to conduct further studies, after driving on the steepest slope ever encountered by any rover so far, on Knudsen Ridge. The slope is on the edge of Marathon Valley, where Opportunity has been conducting extensive studies of the terrain, searching for clay minerals which had been already identified in some spots within the valley by the Mars Reconnaissance Orbiter. The location also offers stunning views overlooking the huge Endeavour crater, which Marathon Valley is on the western edge of, cutting through the raised rocky rim. The intended target was close to the crest of Knudsen Ridge, but the slope caused the rover to tilt as much as 32 degrees, and engineers decided to skip that target and choose a new one, out of safety concerns for the rover. The rover’s wheels turned enough to travel 20 metres (66 feet), but slippage on the slope resulted in the rover actually moving only 9 centimetres (3.5 inches). Both the old and new targets are in regions where clay minerals have been found; the new target is farther west on the hillside. 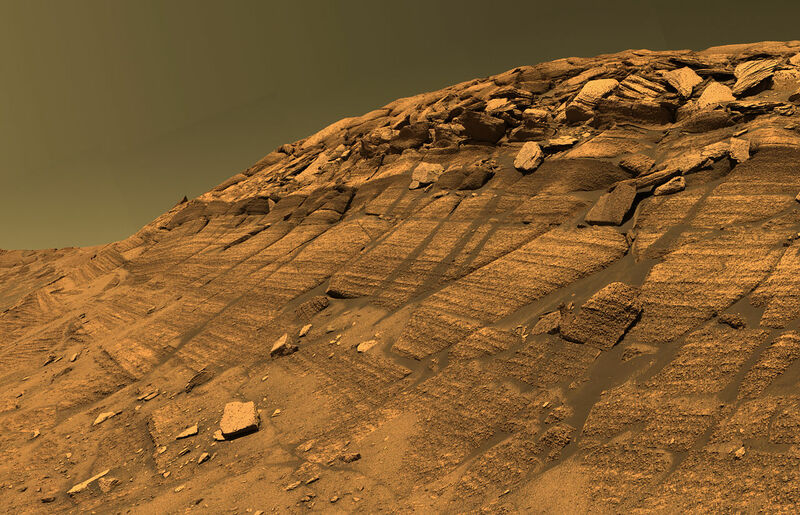 Previously, the steepest drive ever done by Opportunity was at Burns Cliff on the edge of Endurance crater, nine months after the rover first landed on Mars in January 2004. At that time, Opportunity had already outlived its nominal 90-day mission by several months. Few engineers or scientists thought that the rover would still be exploring 12 years later! Last January, when the rover was traversing the steep slopes, the wheel slippage was a lot less. Material in so-called “red zones” is of great interest to the mission scientists, since that is where the clay minerals are. Clay minerals are evidence for a much wetter past in this region billions of years ago, and are usually produced in water that is neutral or non-acidic. “We’re hoping to take advantage of the steep topography that Mars provides us at Knudsen Ridge to get to a better example of the red zone material,” said Steve Squyres of Cornell University, Ithaca, N.Y., principal investigator for the mission. Knudsen Ridge is a great look-out point, overlooking the vast floor of Endeavour crater, which is 22 kilometres (14 miles) across. It was named after Danish astrophysicist and planetary scientist Jens Martin Knudsen (1930-2005), who was a founding member of the science team for both Opportunity and its twin rover Spirit, which stopped functioning in 2009. Opportunity previously climbed to the summit of Cape Tribulation, which is also on the western edge of Endeavour crater and about 1,390 metres (4,560 feet) tall, the highest point on the rim of the crater. Opportunity has been exploring the western rim of Endeavour crater since 2011 and Marathon Valley since 2015. “The view at the summit is spectacular,” according to rover science team member Larry Crumpler, of the New Mexico Museum of Natural History & Science (NMMNHS). Several long dark streaks of sand or dust can also be seen on one of the rover’s solar panels, which formed due to the rover’s steep angle. The steep tilt and vibrations from the movement of the rover caused the sand or dust to run down the solar panel in streaks. The rover also recently survived its seventh winter on Mars – over 12 years, with a Martian year being a bit longer than an Earth year. The amazing longevity of this rover shows just how well it was designed and built, far exceeding anyone’s expectations. Over the years, Opportunity has confirmed that there used to be extensive groundwater and playa lakes in Meridiani Planum, although the water was rather acidic in most places, apart from the locations with the clay minerals. 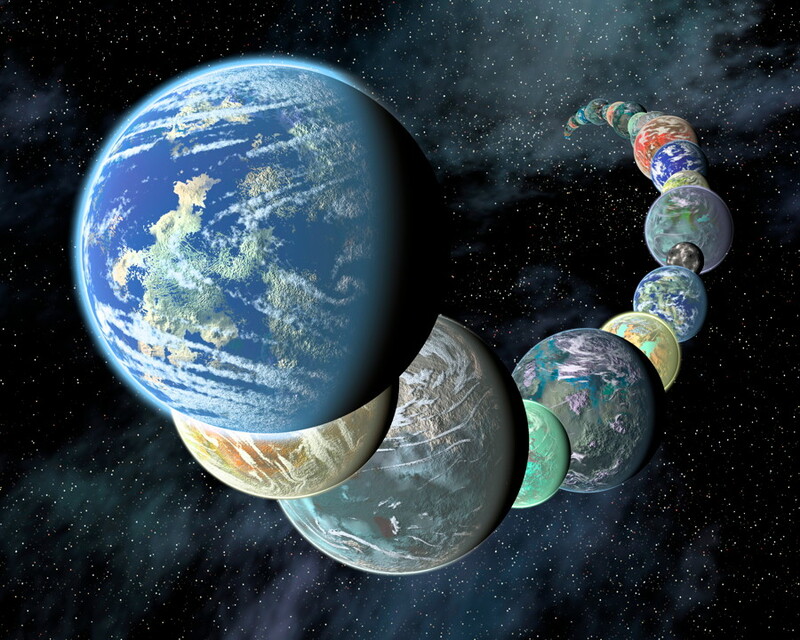 Still, the region was at least potentially habitable millions or billions of years ago. 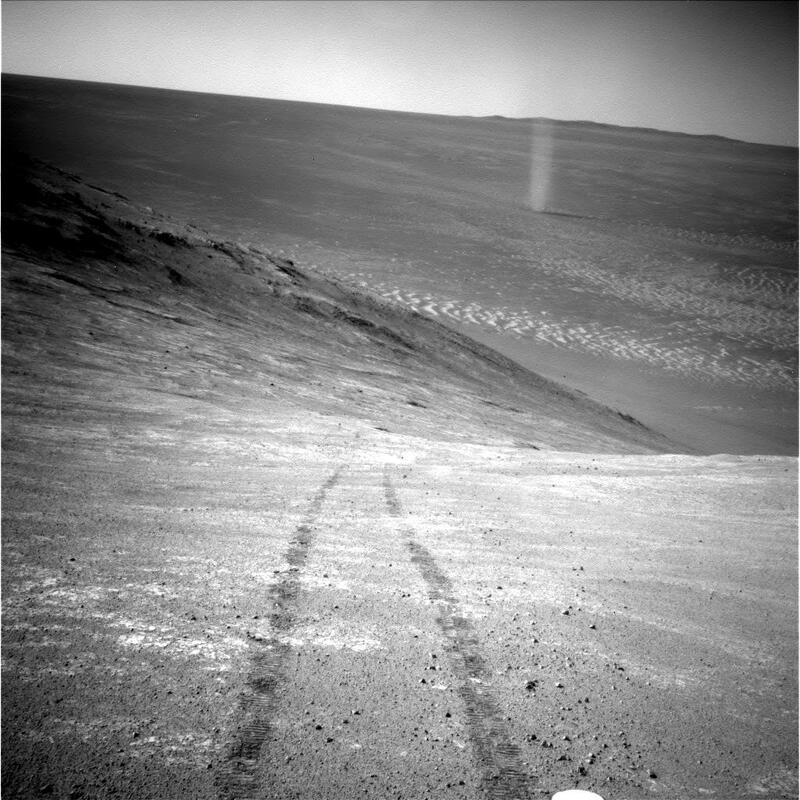 Just a few days ago, Opportunity also photographed a prominent dust devil whirling out on the relatively flat terrain inside the expanse of Endeavour crater. Sightings of dust devils by Opportunity have been few and far between, although many were seen and imaged by its twin rover, Spirit, in Gusev crater (which also landed in 2004) before the rover was caught in a sand trap and stopped functioning in 2009. Some great images and animations of some of those dust devils can be seen here. The topography inside Gusev crater seemed ideal for the formation of dust devils, while the flatter plains of Meridiani Planum where Opportunity is, even inside Endeavour crater, are less conducive. 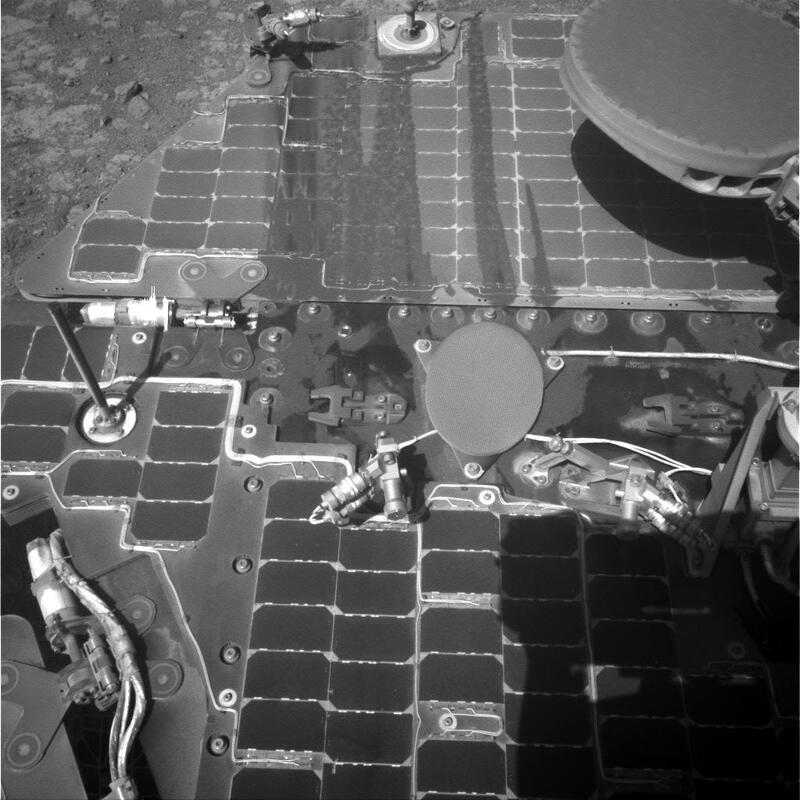 Other gusts of wind, however, have periodically helped to clean dust off the solar panels of both rovers, aiding in their longevity. Such phenomena are a reminder that Mars’ atmosphere, while thin, can still produce relatively strong winds including dust devils. Even in the thinner atmosphere, Martian dust devils can reach heights of hundreds of feet. The massive sand dunes, widespread on the planet, are of course another indication of this. Other dust storms can encircle the entire planet at times. Although colder and drier now than it used to be, Mars is still an active place in many ways. More information about the Opportunity rover mission is available here. This article was first published on AmericaSpace. Dust devils on Mars? Awesome!